Croatia right back Sime Vrsaljko has been ruled out of Wednesday evening’s semi-final against England with a knee injury. The Atletico Madrid star was forced off seven minutes into extra time during Saturday’s penalty shootout victory over Russia. 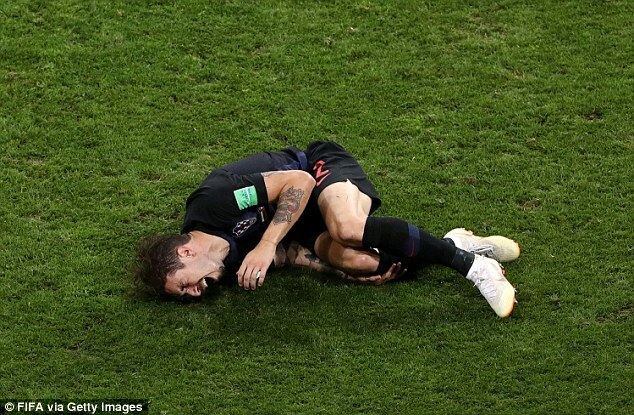 And Spanish outlet Marca now report that the 26-year-old will not recover in time to play England in Wednesday evening’s semi-final at the Luzhniki Stadium. Veteran defender Vedran Corluka is expected to feature instead of Vrsaljko in Croatia’s starting line-up with the 31-year-old replacing him on Saturday. Corluka featured as a centre back alongside Dejan Lovren while Domagoj Vida was shifted out to the right side of their defence. Speaking ahead of the match, Corluka spoke up the occasion as Croatia bid to reach the World Cup final for the second time in their history. ‘No it’s not just another game,’ Corluka said. ‘We have been watching England in all their games. They are confident and have a young team. But before they didn’t have any pressure. ‘You all just said to them, “Just do what you can”, but now even you are hoping that it can “come home”, yeah? We have never won the World Cup so we can’t say the same thing, can we?’. Croatia have played 120 minutes in each of their past two matches, with penalty shootout victories in the last-16 over Denmark and the quarter-final over Russia. Too bad for Croatia. He has been one of their best players in the tournament.